What is Microbial Design Studio? It’s “a countertop biofabrication machine that brings together the capabilities of a biology wetlab into a single inexpensive piece of hardware to design, culture, and test genetically modified organisms.” The Biorealize team used the Biomedical Library 3D printing lab to create the prototypes for the device. In fact, every plastic part on the surface of the machine was 3D-printed at the Biomedical library. Dr. Telhan tells us that the outcomes of this work were disclosed as inventions to the Penn Center for Innovation (PCI), have been exhibited in numerous venues including the Pennovation Works‘ booth at the SXSW Interactive Trade Show, and featured in the Philadelphia Inquirer, Popular Science, Forbes, and other publications. 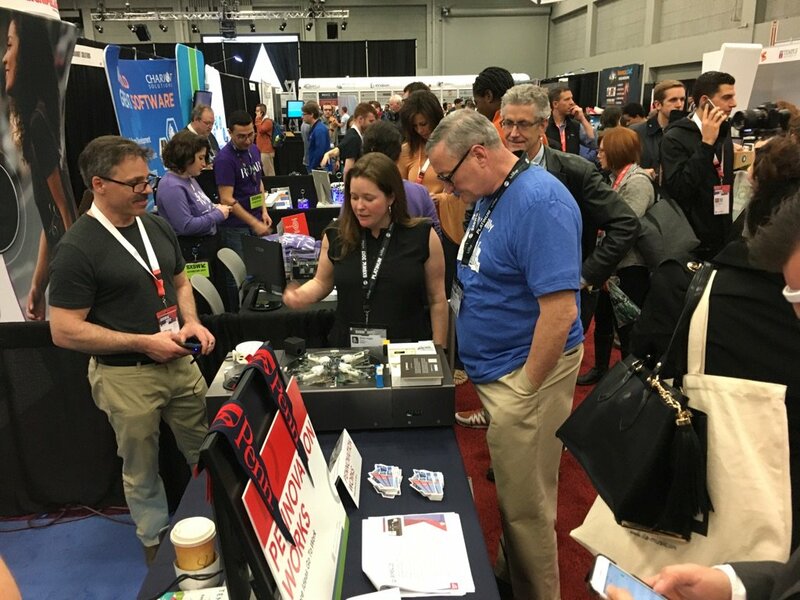 Major Kenney appreciating one of the Microbial Design Studio machines at the Pennovation Works‘ booth on display at the SXSW Interactive Tradeshow in Austin, TX in March of 2017. Every plastic part on the surface of the machine was 3D-printed at the Biomedical library. The Biorealize team has also used the Biomedical Library 3D printing services as part of the team’s NSF grant for developing an educational version (bioMAKERLab) of the platform. When Dr. Telhan wrote to share with us the importance of our 3D printing services to his work, he appreciated our lab’s quick turn-around time and the high quality ABS printing that is available in multiple colors. He also said that it would be great if the lab could extend its services to include additional equipment and multi-material printing. Well, we’re happy to report that we acted upon his request — and that of many other researchers — and we do now provide 3D printing in flexible and clear materials. Kudos to Dr. Telhan and his team for their revolutionary research, with our thanks for letting Barbara Kountouzi know that her 3D Printing operation has made a difference in their work.